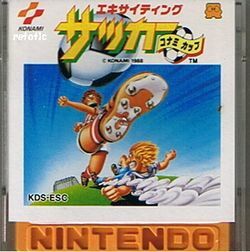 Exciting Soccer: Konami Cup is a American soccer/European football game developed by Konami and published for the Famicom Disk System early on in 1988. It is, in fact, the second only Soccer game developed for play on the Famicom since the original Soccer title was published by Nintendo in 1985. It is part of Konami's "Exciting Sports" series, which also includes Exciting Baseball and Exciting Basket. Players select one of the various soccer teams, and aim to become the best team in the league. Each team possesses different levels of kick strength, endurance, dribbling technique, defensive skill, and luck. They are set at the beginning of the game, but can be enhanced through training. During play, the view of the field is a bird's eye view, with either goal located at the far top and bottom sections of the field. Although this game is considered a relatively minor release, it's ending BGM entitled "Seaside Memory" is highly revered. This page was last edited on 22 March 2012, at 22:13.